A long held desire to visit the Kalahari was the real catalyst for this trip. Access through South Africa is the easiest way to get there, so we decided to fly into Cape Town and bird the route north to the Kalahari Gemsbok National Park, or the Kgalagadi Transfrontier Park, as it is now known. The Park is vast: at 37,991 square kms, almost twice the size of the Kruger National Park, itself the size of Wales. Our goal was to see the 'dry' species and as many mammal species as we could over five days in the park, and five days in Bushmanland. We managed 32 raptors, 6 bustards, and 14 lark species overall, of which only the larks we really slipped up on. We did relax on occasions; a dedicated birding crew would have done better, but we enjoyed the area immensely, and got rather hooked on mammal watching, and searching for big cats. What appealed to us is that within the National Park you have to find everything yourself; no trucks laden with tourists and guides in radio contact. This is also a good time to see some species in breeding plumage, eg whydahs, some bishops and weavers, and the occasional displaying bustard. We also did some birding in the south, the Cape peninsula, Overberg, and the West Coast. We used no guides, and missed some species difficult at this time of year. A Simon's Town pelagic finished off the trip nicely. Flights through Trailfinders www.trailfinders.com Heathrow - Cape Town non-stop, both outward and return flights overnight, on South African Airways, cost £652 plus £56.20 tax each. Expensive and seemed even more cramped than usual, food and service not brilliant either. Would try BA next time. Car Hire through Holiday Autos rentalenquiries@holidayautos.co.uk. Rental company in Cape Town Europcar. Total cost £745 for 29 days hire, for a T group car with air con. Both companies a pleasure to deal with, Europcar giving us an up-grade to B group Toyota Corolla 1.6 with air con. and bags of room. The car was excellent, reliable, and had very good tyres. We had no punctures. We did 7,518 kms, many over gravel roads. Air con. is essential at this time of year. Holiday Autos do a Damage Excess Refund costing £1.50/day. Money, etc Exchange rate during trip about 12 Rand to £1. Mastercard and Visa used everywhere except filling stations; don't even bother trying to pay for fuel by credit card, it's not worth the hassle; strictly cash only. As we were away for a month, we took travellers cheques. For a shorter trip, or if you're willing to risk it, I'd advise taking cash, ie Rand and/or sterling. SA banks are obsessed with fraudulent financial activity. Changing travellers cheques never took less than 20 minutes, usually half an hour: that's after you've queued up. As you mainly need it for petrol, changing sterling into rand on arrival at the airport would seem a good idea. Mobile phones Worked everywhere except, to state the obvious, the Kalahari, ie north of Twee Rivieren. All phone numbers given here include international dialling code +27, thereafter dropping the first zero. CAPE/SIMON'S TOWN - Boulders Beach, Cape peninsula, Kommetjie, Silvermine Lower River, Strandfontein, Rondevlei, Kirstenbosch, Constantia, Hout Bay, Tokai, pelagic, Intaka Island. WEST COAST NP - Darling, Silwerstroomstrand, Koeberg NR, Velddrif. PAARL - mountain, sewage works. BUSHMANLAND - Calvinia, Brandvlei, Augrabies Falls NP, Pofadder, Onseepkans, Koa, Upington. KGALAGADI NP - Twee Rivieren, Nossob, Union's End, Mata-Mata. 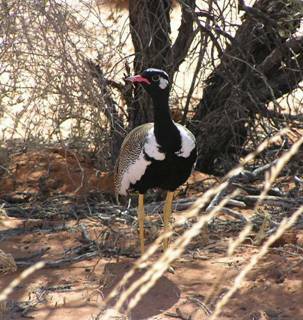 KAROO NP - visited en route from the Kalahari to Wilderness NP. WILDERNESS NP - rained off ! OVERBERG - Bontebok NP, farmland loop, Grootvadersbosch NR, De Hoop NR. At this time of year, we had no problems just turning up and finding somewhere. We did phone the Kgalagadi NP a few days in advance to book our chalets there, as driving 250 kms from Upington without a secure booking could have been risky, as we had no tent. We booked Avian Leisure, Simon's Town, on the internet for our first few nights in Cape Town. Note that some places charge per person per night, others per double room/chalet per night. Congenial hosts Patrick and Marie-Louise Cardwell, and wonderfully situated accommodation: a combination that I doubt could be bettered, the view alone is breathtaking. With a deck looking out over the natural fynbos garden, good birding starts here. Patrick, an experienced local birder, leads nature tours all over SA, and advice from him before leaving for the Kalahari was invaluable. R210 per person/night S/C with kitchen, TV, phone, laundry service and tea/coffee/milk provided. No smoking. Very nice guesthouse with swimming pool and views. R300 per person/night including breakfast. No smoking. A national monument and the oldest buildings in Calvinia, dating from c 1853; an original Cape Dutch homestead. Accommodation is in restored Victorian cottages with original furniture. The restaurant is in the main farmhouse, beautifully maintained, with display of period furniture and separate coffee shop. Traditional Afrikaans food served. An experience not to be missed. Paid cash here so can't remember exact price, but think it was about R220 per person/night including breakfast. Brandvlei Hotel, Brandvlei 2 Brandvlei 8915, SA. +27 54 603 0002. Let's just say the worldwide web passed Brandvlei by.. A quirky little place with hot rooms, no air con. but clean, cheap, and run by nice people. R170 per room/night, breakfast/dinner extra. Excellent S/C chalets close to falls. Kitchen, air con. TV, braai, swimming pool, etc. R450 per room/night. Camping also available. Pofadder Hotel, Pofadder PO Box 3 Pofadder 8890 SA. +27 54 933 0063. Country hotel with swimming pool, nice bar and hot buffet in the evening. Good value. R270 per room/night, breakfast/dinner extra. Die Eiland Resort, Upington Upington 8800, SA. +27 54 334 0286/7/8. Very nice S/C chalets on southern bank of Orange River. Hoopoesville - 15+ counted outside chalet in evening: good birding in grounds. Kitchen, air con. TV, braai, and swimming pool. R230 per room/night. Camping also available. Kgalagadi Transfrontier Park - booking/accommodation info. General enquiries +27 54 561 2000. Bookings +27 12 428 911. The computerised booking system works very well, we booked and paid for our accom. using Visa, and were given a booking ref. number. The general enquiries number won't take bookings, but will tell you about general availability. When we arrived at Twee Rivieren everything was on the system as booked and paid for. All three restcamps are 'live', ie online. We paid R2025 for six nights: 1 at Twee Rivieren, 3 Nossob, and 2 Mata Mata rest camps. In retrospect, only one night at Mata Mata and the final night at Twee Rivieren again would have been better. As Mata Mata is right on the Namibian border, one can only travel south from there. All the chalets are very good, with kitchen [with electric hot plate], overhead fan and braai. At Nossob and Mata Mata the electricity goes off at 11.00pm, on again at 5.00am. There are food shops in all three restcamps; these sell frozen meat, beer, wine and other basic essentials. Camping available at all three rest camps. Virtually all info about the park is on the excellent website www.parks-sa.co.za , a portal to all SA National Parks, the Kgalagadi site being particularly comprehensive and including a map. You can also book online there. If you're impressed with the website, you won't be disappointed on arrival. SA National Parks are obviously very well rescourced, presumably in recognition of the importance of tourism to the economy. The whole network seems well integrated and organised, with superb facilities and friendly and efficient staff. On the website are details of the International Wild Card, a 'season ticket' for entry to all SA National Parks. We bought one at Augrabies and it undoubtedly saved us money. At the time cost was R1000. To give an example, the daily permit for Kgalagadi is R120 for every day you are in the park. This is for non-SA nationals. Other parks are cheaper, often R60. As we visited many other parks, it was good value, especially as they are so well run. My impression throughout was that conservation really does take priority, and some NP's are currently expanding. There's a post box and public telephone [card and coin] at Twee Rivieren. Transkaroo Country Lodge, Britstown. PO Box 10, Britstown 8782, SA. +27 53 672 0027. A South African 'travel-inn'. Pleasant, functional, nice central courtyard for after-dinner drinks. Would advise asking for a room away from the busy main road at the front. TV, air con. and swimming pool. R285 per room/night, breakfast/dinner extra. Convenient north - south stopover point. Wonderful S/C log cabins beside the River Touw, with fridge and braai. Access from N2 c.2 miles east of Wilderness village, signposted but easy to miss. Cheaper bungalows available, also large campsite. Facilities include canoe and bike hire. R300 per cabin/night. Swellengrebel Hotel, Swellendam. PO Box 9, Swellendam 6740, SA. +27 291 41144. Quite a posh hotel [3 stars] with nice swimming pool, sauna and gym. Our room was noisy and the restaurant service awful, the food mediocre at best, so wouldn't recommend. R395 per room/night, breakfast/dinner extra. Buchu Bush Camp, De Hoop. PO Box 820, Bredasdorp 7280, SA. +27 285 421 602. Log cabins and reception/bar/restaurant building on fynbos site next to De Hoop NR. Cabins are huge, have a kitchen, and can sleep 6. Access from just outside of main entrance to De Hoop NR. R650 per cabin/night, so good value for 6, not so good for 2. If you use the De Hoop NR accommodation, you need to take in food. Arniston Seaside, Arniston. Reception at First Avenue. Various S/C seaside cottages and flats owned by one company. Signposted on main Bredasdorp road. We stayed at a huge flat in Harbour Road, very well equipped and furnished. R360 per flat/night. Arniston has one shop [general store, but no fish or meat when we were there] and one restaurant, behind the shop; the food here was superb, but best to book at weekends. Wonderful S/C cottages beside stream [Disa River] in semi natural wooded gardens. Small solar heated swimming pool, tranquil surroundings and private road. Sumptuous inside with fully equipped kitchen, TV and sound system. Found through TOBI tourist office, Main Road, Hout Bay, next to The Rumblin' Tum Restaurant. Owners Jenny and Henry Nelson were very helpful; it was 9 pm, and they'd shut the office. Along the road there's a very good Chinese take-away. NB Most places we stayed at had a very rapid laundry service - some less than a four-hour turnaround. Other trip reports have covered most sites amply, as does the 'Essential Birding..' guide. Here are some notes to update currently available info, plus a couple of new ones. Both these were given to me by Patrick Cardwell, and both are little gems. I've not read about them anywhere on the net, probably because they don't hold lots of SA endemics; they're both 'urban' wetlands, but what struck me was that on brief visits both were positively heaving with birds. A 16-hectare reserve near central Cape Town, just behind [west of] Century City/ Canal Walk Shopping Precinct; thus killing two birds with one stone, except we never quite made it to the shopping precinct..
Travelling east along the N1 from Cape Town, past the R27 [west coast] junction and then the M5 junction, keep left for next junction, Ratanga Junction, with signposts for Century City/Canal Walk, exit 10 Sable Road off-ramp. Follow Century Drive signs. Take Century Drive off-ramp and turn into Century City. At the traffic lights, turn left for Ratanga Theme Park and Canal Walk. Then turn right at a roundabout signposted golf course, which leads into a building site. Stop at security checkpoint, ask the guard and he will point you in the right direction, straight through and round to the right. It's an area of development, so things are constantly changing - it's actually easy to find, but access details will undoubtedly change. Just ask for Intaka Island, as locals are aware of it. There are reasonable maps and directions on the above website that would be worth downloading, also some nice photos. The reserve is basically a water purification plant for the water that is used in the network of canals at Century City. The eastern part consists of seasonal saltpans and sand plain fynbos, known as Blouvlei. The pans were dry on our visit, but in spring should be excellent. The western part comprises an entirely man made wetland where the water is circulated for purification by natural processes. Here there's a thriving artificial heronry, complete with a few remaining decoys. The whole thing knocks Cliffe Marshes and Rainham into a cocked hat, considering it's small size. There's a security guard/naturalist there who's really enthusiastic, and a paltry entrance fee. We spent less than an hour there; it would be worth half a day in the spring. In that time we saw 6+ African Snipe, 1 male Painted Snipe, 2 Water Dikkop, 4+ Spotted Dikkop, various other waders, darters, herons, paradise flycatcher, weavers, common waxbills, plus many common species in a small area. Little Bittern [summer] and African Rail [winter/spring] are regularly seen. 120 species recorded so far, since 1997. On approaching Fish Hoek from the north along the M4 to Simon's Town, there is a bridge and obvious wetland area on the right. Turn right before the bridge, and on the left is a parking area. Park here and walk west along the boardwalk. We only walked the first part to the footbridge across the marsh; the whole reserve looks worth doing, probably taking a couple of hours. From the bridge we saw 2 Spotted Dikkop, Three-banded Plovers, 2 Intermediate Egrets, Purple Heron, Pin-tailed Whydahs, White-throated Swallows, Levaillant's Cisticola [very common], 80+ Common Waxbills and Yellow-billed Ducks. All within yards of the main road. Painted Snipe and Grey-headed Gull are regularly seen. At the Cerebos Salt Works, we were refused permission to drive around the pans, but allowed to walk round them, even though the bunds were rock hard. This wasn't a problem, and we located the Chestnut-banded Plovers just north of the offices on the first pans that weren't pink with salt, close to the main road. The disused pans on east side of main road were good for waders and Lesser Flamingo; we drove around these. Take care at point 6, map on page 53 of 'Essential Birding.' as we nearly got stuck on 'the sandy track'..should read 'track that disappears into sand.' ! According to a local farmer, many visitors get lost trying to find the reserve, not helped by the fact that there is a farm called Grootvaders Bosch ! Most apparently end up at Barrydale, as we did. There are no signposts for the reserve until you are virtually at the entrance. Following directions in 'Essential Birding', drive through Suurbraak heading east, stay on this road, do not turn off left to Barrydale. The road becomes gravel and is the R322. Stay on this road, passing one left turn; the important left turn is the one sign-posted GOEDEHOOP. This presumably is the [left] fork mentioned in the book. Stay on this road, past a left turn, until arriving at an obvious fork where there is a big signpost for the reserve, keep left and this track leads to the car park. If camping you need to bring in food, etc. There are no guides for hire in the park. The only organised guiding trips are the night drives [ not Mata-Mata] and the day walks, taken early in the morning. We did one night drive and can thoroughly recommend them for the price - see bird and mammal lists, and wish we'd done an early morning walk. The speed limit of 50 km/hour is well worth sticking to - we hit a ground squirrel at about 40 km/hr and had to kill it. Early a.m. there are lots of things in the road, some quite slow to respond, especially snakes and reptiles. We usually hit 'siesta mode' in the heat of the day, 40 degrees plus, and went out again late afternoon. Don't feed anything, particularly jackals as they've become a nuisance in the camps. Stock up with bottled water to keep in the car on every outing. Officially people aren't supposed to alight from the car anywhere else but at a restcamp or picnic spot - creating obvious problems ! In the event of a breakdown you would just have to sit it out until someone else passes. The day we drove to Union's End from Nossob return we saw three vehicles all day, although one of these was a park patrol. When the Gemsbok National Park [ Botswana ] and the Kalahari Gemsbok National Park [South Africa ] were joined in 1998 the Kgalagadi became the first transfrontier park in Africa. Access to the Botswana side is open, but only for four-wheel drive vehicles. Lions 450, Brown Hyenas 590, Leopards 150, Cheetahs 200, Spotted Hyenas 370. People have different strategies for dealing with pelagics. Personally, I favour going out with an empty stomach and eating something onboard. The price included one sandwich each, so I'm glad I took a couple of rolls and a Mars bar; fizzy drinks and bottled water are also provided. The decision to sail is taken the previous evening based on maritime weather forcasts. They won't go out in daft conditions; the guides don't want to miss any birds either. A fairly heavy swell on rounding the Cape is normal conditions. I found the best way to cope with viewing was to sit on the aft cabin roof with legs braced against the handrail, giving both hands free on your bins. That way one seemed to move with the boat and not miss too much. The guides were excellent, very sharp and very helpful. There are now 2 to 4 trips per month, but booking well in advance is still essential as they're very popular. Cost R890. FIELD GUIDE TO THE LARGER MAMMALS OF AFRICA Chris and Tilde Stuart, publisher Struik, £16.99 from Wildsounds www.wildsounds.co.uk Took this and found it invaluable. FIELD GUIDE TO THE MAMMALS OF SOUTHERN AFRICA Chris and Tilde Stuart, publisher New Holland. £14.99 from Wildsounds www.wildsounds.co.uk Used at home for reference, similar to above but also covers smaller species like mice, etc. 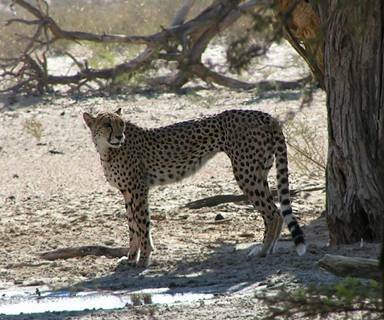 KGALAGADI TRANSFRONTIER PARK - OFFICIAL INFORMATION GUIDE Published by park authorities. Excellent, informative soft back; essential reading. Contains bird and mammal lists and loads of other info. available from Twee Rivieren reception and not expensive. SASOL BIRDING MAP OF SOUTHERN AFRICA Scale 1:3,500,000 Hardaker and Sinclair, publisher Struik, £4.99 from Wildsounds www.wildsounds.co.uk Excellent route map and planning tool. GLOBETROTTER TRAVEL MAP - CAPE TOWN Scale 1:130,000. £4.99 from Amazon www.amazon.co.uk Clearest Cape Town map I could find. MAPSTUDIO TOURIST MAP - SOUTH WEST CAPE Scale 1:250,000. £8.95 from Stanfords www.stanfords.co.uk Good regional map. EUROPCAR TRAVELLING COMPANION Free glove box road atlas from Europcar. So good we used it throughout whilst in the Northern Cape. The book shops at Kirstenbosch and Twee Rivieren have an extensive selection of natural history books, especially Kirstenbosch, who stock the Guy Gibbon videos BIRDS OF SOUTHERN AFRICA Vols 1 to 3 at R130 each. I used three excellent trip reports from the internet; all were very useful at planning stage and thanks to all the authors for putting them out. THE WESTERN CAPE, SOUTH AFRICA, 17th to 26th January 2003 by MIKE POWELL and PHIL BRISTOW. SOUTH AFRICA: WESTERN AND NORTHERN CAPE, 21st February to 14th March 2001 by CHRISTOPH MONING and CHRISTIAN WAGNER. CAPE PROVINCE, SOUTH AFRICA 20th February to 6th March 1999 by GRUFF DODD.